Two start-up companies, founded to commercialize research on renewable biochemicals at Iowa State University at Ames, received small business research grants from National Science Foundation to develop their technologies for the marketplace. The companies — OmegaChea Biorenewables in Ames and Glucan Biorenewables in St. Louis — are spin-off enterprises from Iowa State’s Center for Biorenewable Chemicals. 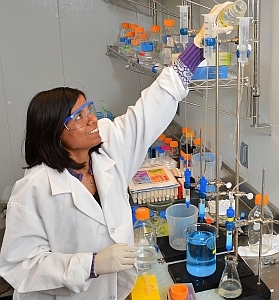 OmegaChea Biorenewables, founded by biochemistry doctoral candidate Shivani Garg, is developing bio-based feedstocks for household products like detergents, lubricants, and polyester plastic made today largely from petroleum-based raw materials. In her research, Garg re-engineered enzyme-producing microbes that transform omega fatty acids into catalysts for processing plant sugars into bio-based chemical feedstocks. The NSF grant supports the work of two Iowa State faculty, Ludmila Rizshsky and Basil J. Nikolau, who are partnering with OmegaChea Biorenewables to devise a manufacturing platform that scales up Garg’s research from the lab to the factory (Nikolau is also the company’s chief scientist). The one-year, $225,000 grant was awarded by NSF under its Small Business Technology Transfer program that supports joint ventures between academic scientists and small companies. Glucan Biorenewables is also a Center for Biorenewable Chemicals spin-off company, but most of its academic research was conducted in the lab of James Dumesic at University of Wisconsin in Madison, a partner in the Center with Iowa State. The company is developing a technology for converting biomass to chemical feedstocks using a solvent derived from biomass. Lab evidence indicates the solvent, known as gamma-valerolactone, offers yield and cost advantages over current methods. The six-month $150,000 Small Business Innovation Research (SBIR) grant from NSF will fund a proof-of-concept study testing the Glucan Biorenewables process on real agricultural residues, such as corn stover and bagasse; it has so far been tested in the lab only with pure glucose and xylose sugars. Wisconsin’s David Alonso, a colleague of Dumesic, is leading the study. SBIR grants fund scientific research with commercial potential by small businesses. Center for Biorenewable Chemicals has 30 industry partners, ranging from start-ups like OmegaChea and Glucan Biorenewables to industry giants like Michelin and BASF. One of the Center’s objectives is to encourage entrepreneurship, and uses it as a way of testing the commercial potential of its discoveries.